There is a bit of social wisdom that notes that we tend to forget to be tourists in our own backyard. When you visit somewhere, you make sure to see all the ‘sights’ – the places that make the place what it is, whether natural beauty, historic memorials, art or architecture or some other human achievement. But when you live there you can just get used to the routine and forget to explore. 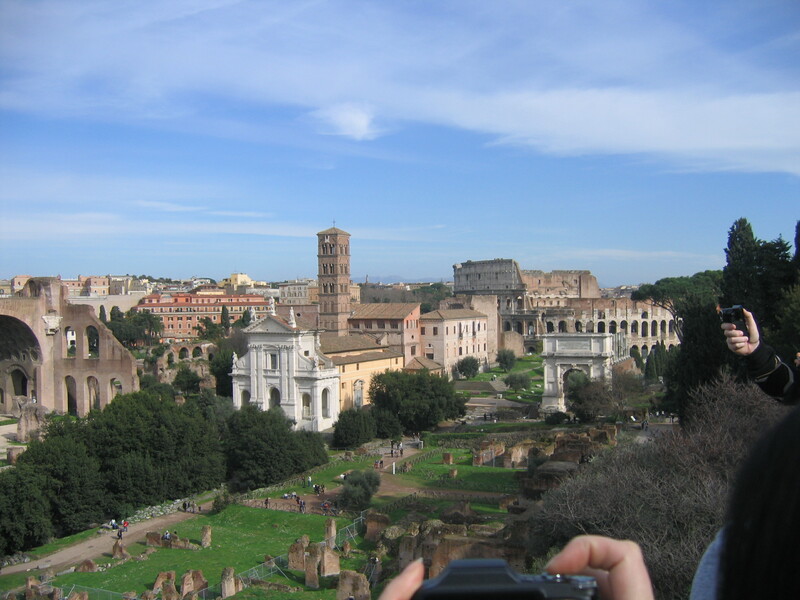 This is how I spent the first five months in Rome, with the Roman Forum visible from my window, but had not made it into the ruins. Even with Nancy’s visit, some of the tourist activities got dropped from the agenda due to rain or just too many to do. So, finally I had the time and the timing to spend part of this beautiful weekend exploring the Palatine Hill, Colosseo and the Foro Romano. On the Palatine hill, which is visible from our terrace, you can see iron-age huts, honored even in Imperial times as the house of Remus and Romulus, founder of Rome. 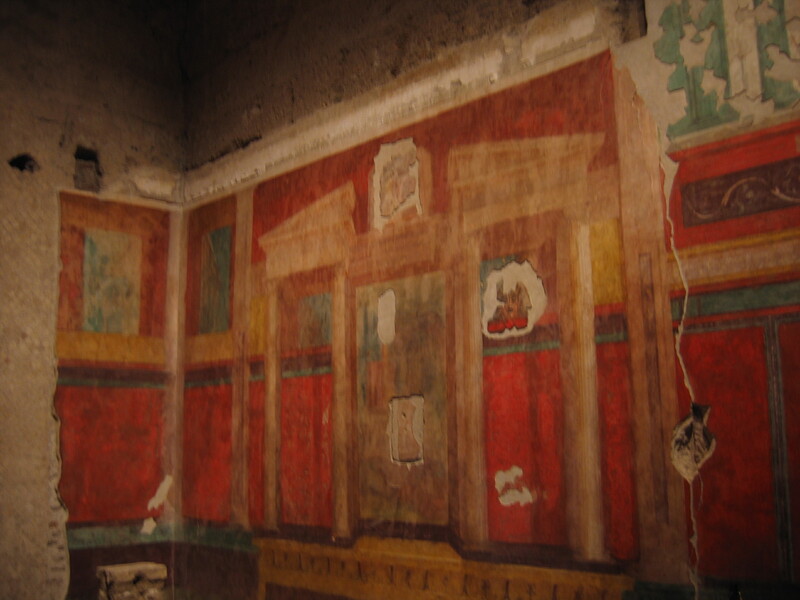 The house of Augustus Caesar and his wife, Livia – strikingly humble in comparison to the other palaces (especially Nero’s!) The entire complex, the Palatine and the Forum, are connected and in some ways are like a giant park – just that the benches you picnic on are likely fallen columns two millennia old. The forum is in fact the old city centre. IN the middle of it is the original forum, a small piazza surrounded by temples and government buildings, and the rest now included is a network of roads, buildings, and monuments. The Via Sacra runs through the middle from the Colosseo to the Capitoline hill, passing through the arch of Titus commemorating the victorious conquest of the Jewish Rebellion in 70 AD on one end, and the arch of Septimus Severus on the other, commemorating his victories a century and a half later in Mesopotamia. 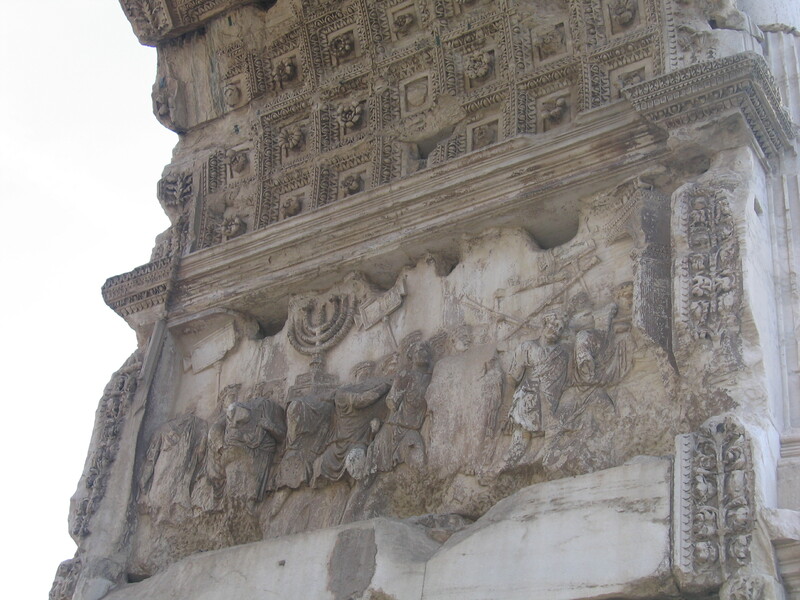 After a week in Jerusalem and seeing the Temple Mount, with the juxtaposition of the Western Wall and the Dome of the Rock, to come back to Rome and see the Titus arch commemorating the looting of the Temple gives some interesting perspective of that episode in history which influences the stability of peace in the middle east even today! The house of the vestal virgins and the Temple of Vesta is nearby. 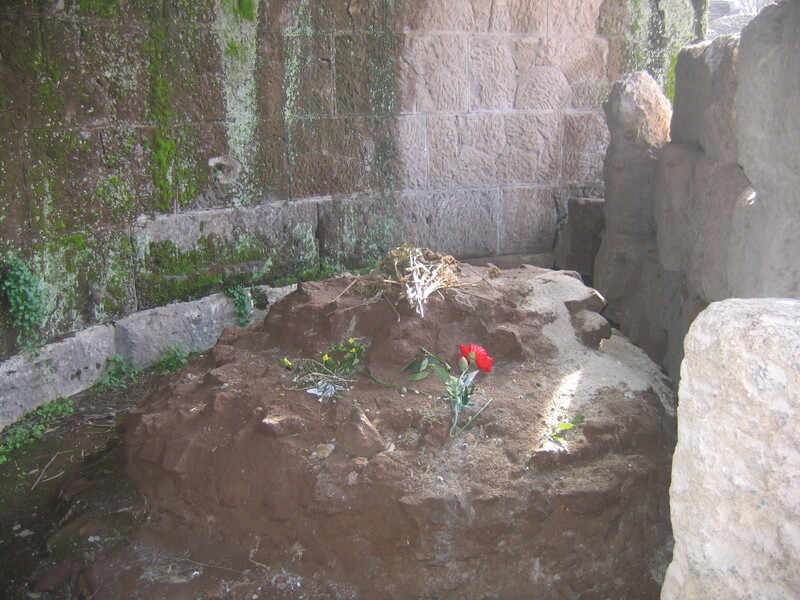 Charged with keeping the City’s eternal flame going inside the Temple, the Virgins were consecrated to service and honored among Romes citizens – they even had box seats at the Coliseum rivaling the Emperors! The six Vestal Virgins were chosen from noble families at a young age, and commissioned to serve for 30 years. At the age of 40 they could retire with a respectable dowry, marry, raise a family, etc. On the other hand, the punishment for violating the vow of chastity during the 30 years was a pretty chilling death – sealed alive in a crypt with a single loaf of bread and a lamp. The massive basilica of Constantine sits on the edge of the forum, visible from the Via dei Fori Imperiali, as is the ancient Roman curia house and senate building. 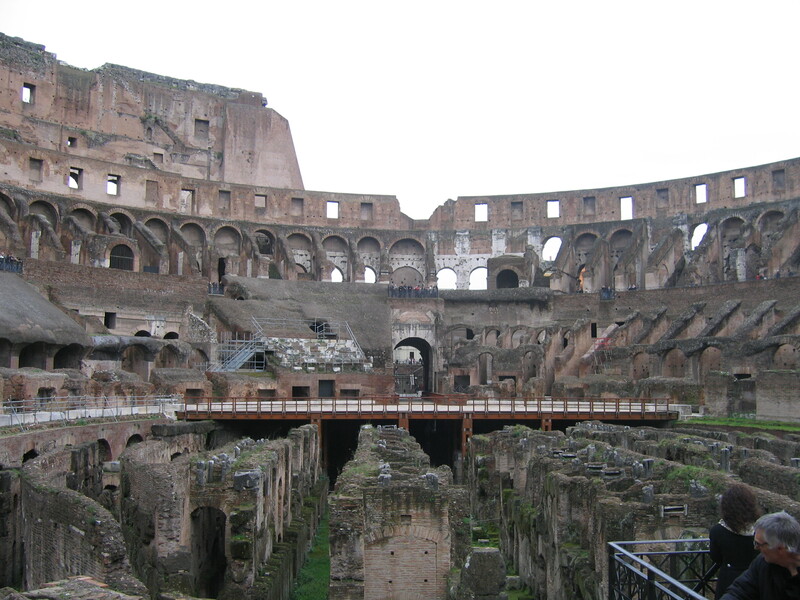 On the closer end of the forum is the Flavian Amphitheatre (the Colosseo), our next-door neighbor. It could seat almost as many fans as Notre Dame Stadium, complete with retractable awning. It was built on the site of a private lake built by Nero for his sprawling palace complex, as one of the efforts for the Emperor to regain the popular support lost by Nero’s cruel insanities. Admission was free, and included food and wine for spectators. 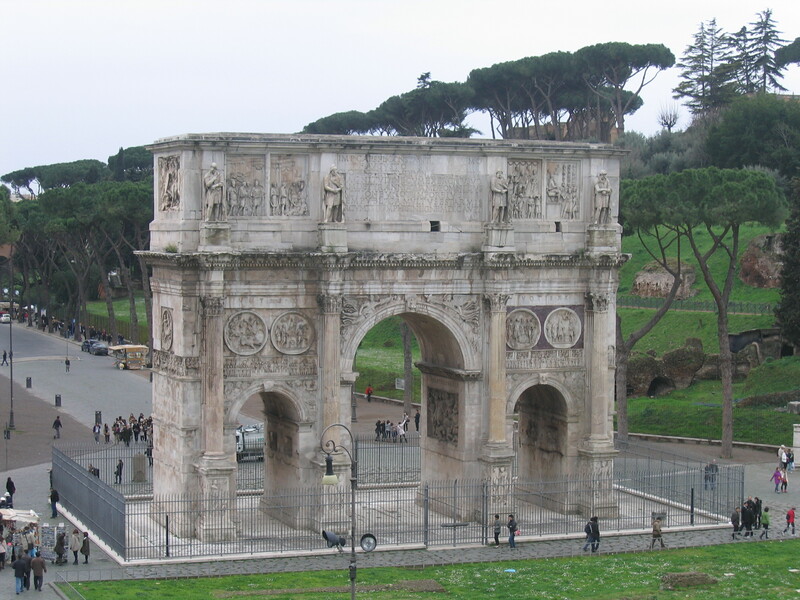 On the plaza between the coliseum and the Via Sacra is another triumphal arch, built by Constantine honoring the triumph of Christianity in the Empire – but using images and statues borrowed from other memorials and palaces around Rome. By A.J. Boyd in La vita Roma on February 28, 2010 . It is so nice to see the picture of Julius caesar place in Rom it isreally too good i love this book very much and i thanks Sir William Shakespear’s a lot to wrote this book everyday i pray the success of Sir W.Shakespear’s am a great fan of him……………..